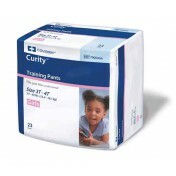 Curity Youth Pants, manufactured by Kendall, are highly absorbent youth pants excellent for overnights or throughout the day. Sized and shaped for both boys and girls, Curity Youth Pants comfortably protect your children from leaks and accidents discretely. 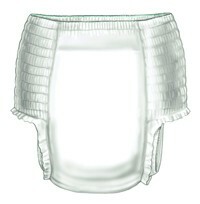 Especially effective for overnight protection in cases of bed-wetting. The super-dry core locks away odor and keeps moisture away from the skin to prevent rashes and chafing. The cloth-like backing not only is comfortable and soft, but also provides extended protection all night against leakage. 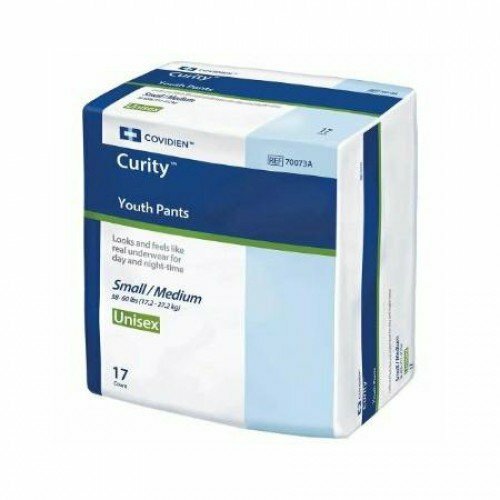 Discreet protection for youths with incontinence, Curity Youth Pants can fit snugly under regular clothing. These briefs looks and feel like regular underwear for added comfort and discretion. Help your children gain confidence during the day or night with Curity Youth Pants. I purchased Curity Youth Pants for my disabled son, they are very absorbent and fit him nicely. My only issue is they rip easily when putting them on and I have found two defective diapers in the shipment. They are expensive too.